1/26/2011 – It is the most prestigious award in Japan, often referred to as the "Asian Nobel Prize". It is given for outstanding achievements in science and technology, and is worth $600,000. 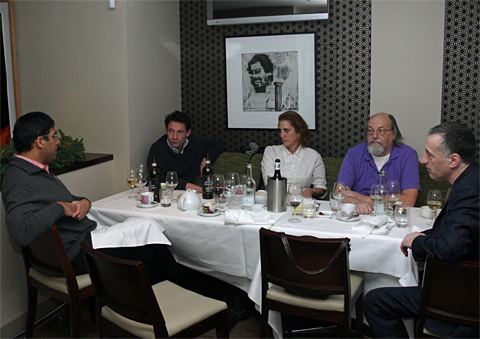 This year it goes to two American scientists who forty years ago created the Unix operating system and the computer language C. One of them is also a computer chess pioneer who visited the London Chess Classic. 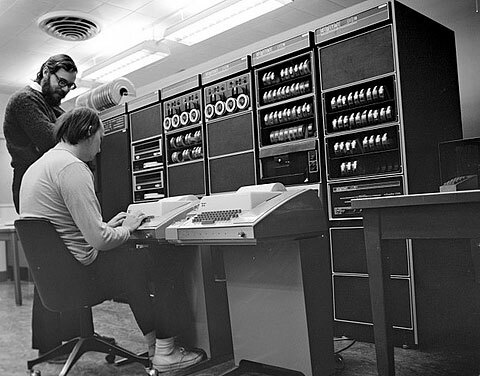 When Ken Thompson and Dennis Ritchie began creating the Unix operating system in 1969, they did not envision that their work would become a backbone of the computer revolution that has transformed the world. 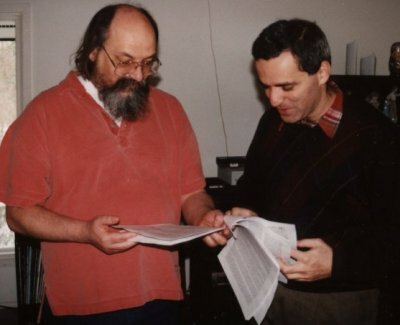 The two Bell Labs computer scientists – named today as winners of the 2011 Japan Prize for information and communications – just wanted to build a better operating system. 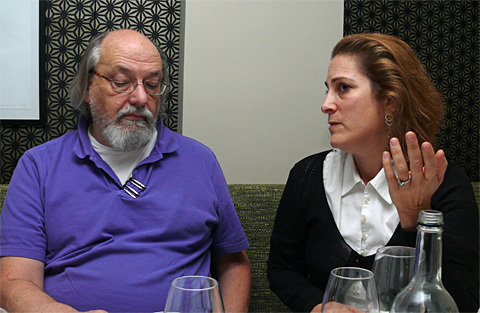 "I did it as a backlash against the bad operating systems of the day," said Thompson, 67. "We were just trying to get something better to get our own work done." 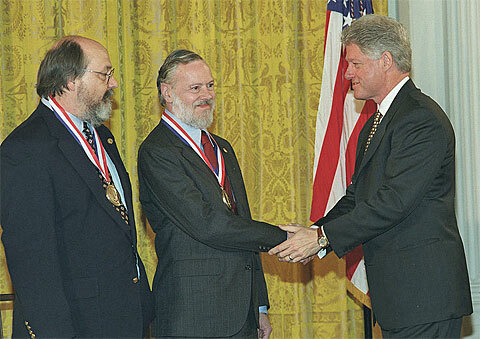 Thompson, now living in San Jose and doing work as a "distinguished engineer" for Mountain View's Google Inc., and Ritchie, 69, now a computer consultant, were named by the Japan Prize Foundation to commemorate their work four decades ago at the old Bell Laboratories, now owned by Alcatel-Lucent in New Jersey. Unix, developed in conjunction with the programming language C, "has significantly advanced computer software, hardware and networks over the past four decades and facilitated the realization of the Internet," the foundation said in a news release. The pair will split a $600,000 prize awarded by the foundation, which began in 1982 to honor those whose work "aims to promote the advancement of science and technology for the peace and prosperity of mankind." Ten Japan Prize winners have also won Nobel Prizes. The Japan Prize is awarded to people from all parts of the world whose "original and outstanding achievements in science and technology are recognized as having advanced the frontiers of knowledge and served the cause of peace and prosperity for mankind." The Prize is in principle given for work done in any field of science and technology, but each year two particular fields are designated based on trends within these areas and other considerations. Laureates receive a "Japan Prize" certificate of merit, a prize medal, and a cash award of 50 million yen for each field. Only living individuals may be nominated for the prize. To give you an impression here is last year's Japan Prize ceremony – which is attended by the Japanese Emperor, his wife and the entire Japanese government. The 2011 Prize to Thompson and Ritchie will be awarded in April. 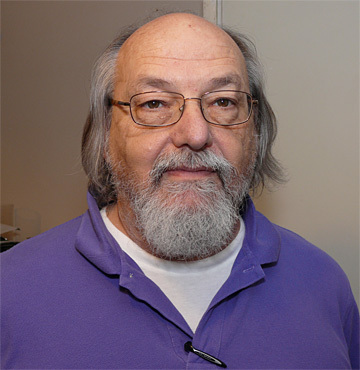 Ken Thompson is famous for Unix and C, but is also considered a computer chess pioneer. In 1979 Ken and a colleague at the Bell Laboratories decided to build a special purpose machine to play chess, using many hundreds of chips, worth about 20,000 dollars. 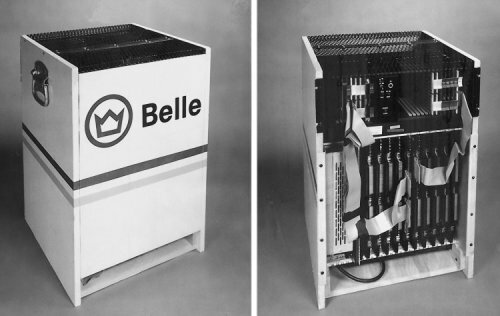 "Belle" was able to search at about 180,000 positions per second (the super-computers at the time were doing 5,000 positions) and go down eight to nine ply in tournament games, which enabled it to play in the master category. It won the world computer chess championship and all other computer tournaments from 1980 to 1983, until it was superseded by giant Cray X-MPs costing a thousand times more. 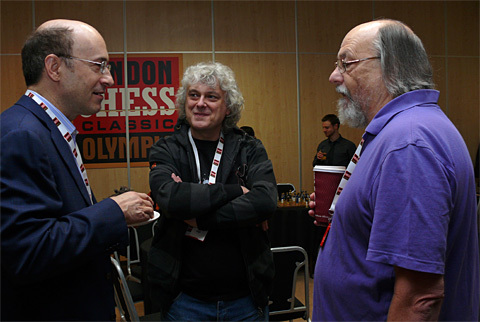 One of the guests of honour at the 2011 London Chess Classic was Ken Thompson, who remains a keen chess enthusiast and is well known to many of the world's top grandmasters. There are many stories to be told about his visit to London in December – at least one involves chess and astronomy – but we will leave that for later. Here are some pictorial impressions. 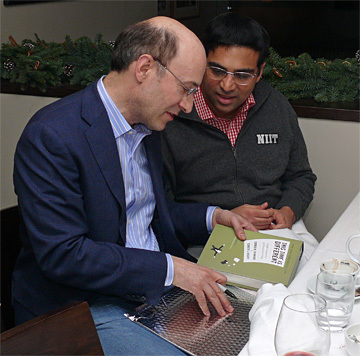 Ken, a four-pen geek, in conversation with Natasha Lance Rogoff, an independent film maker who graduated from the University of California at Berkeley and received a master's degree in international affairs from Columbia University. Most impressively Natasha is responsible for the production of 182 original Sesame Street episodes in Russian. << Tata Steel Rd.9: Will the real leader please stand up? 1/23/2018 – In the early 1980s Ken Thompson, working at the Bell Laboratories, generated one of the world’s first chess endgame databases — king and queen vs king and rook. At the time he explained to Frederic Friedel how this revolutionary new technology worked. He did it in the form of a parable: God calculating the 32-piece endgame and playing chess. It is an amusing thought experiment that has gained interesting relevance at the current time.